The increasingly accessible and competitive world of collecting Western memorabilia. Dale Montgomery starts right from the beginning in his six-part series on training. Part One is all about picking the puppy that’s right for you. 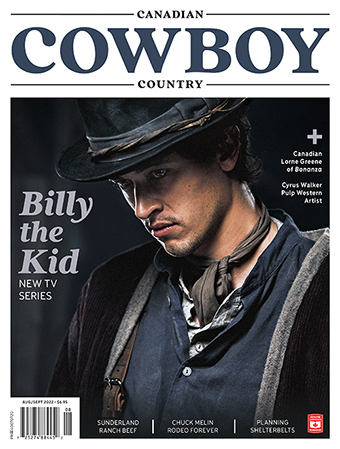 You can read the whole article in the December 2014/January 2015 issue of Canadian Cowboy Country magazine. To subscribe, click here or call Kendra at 1-800-943-7336. Chuckwagon racing is a family sport, and the McKenzie outriders are riding strong. The Blackmer’s home is a warm and welcoming sight on a cold, snowy day. He rode out of the Dust Bowl of the Dirty Thirties and carved out a pretty good life in the saddle. Think your life is complicated? Try ranching in Canada AND Australia—at the same time. Meet the time -travelling Grayson family. A selection of custom beauties from the quirky to the devine. Where to ride your horse and get a higher education. A festive Christmas poem, featuring the magic of Santy.